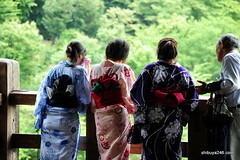 Yukata is a summer kimono made of cotton. In Japan, people wear yukata for bon odori and summer festivals. Yukata means “bathing clothes” and since about 16 century, it was started to be used as “after bathing clothes,” which is not so absorbent like a bath robe but it’s kind of a similar thing. You can see the custom at ryokan (Japanese style hotels), where they prepare yukata for their guests to wear after bath and also as pajamas. To complete yukata fashion, you need yukata which is one piece, obi (tie) and geta (Japanese footwear), at least. There are all kinds of yukata; traditional, modern, characters designed ones and, even for pets!